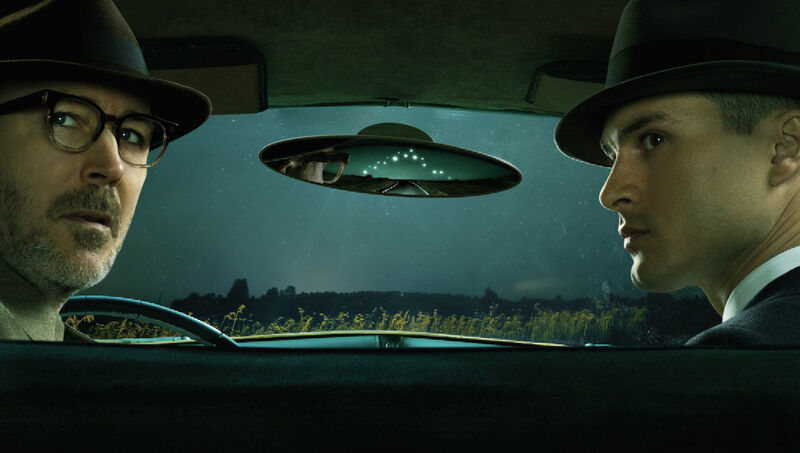 History Channel lands 'Project Blue Book' at NYCC 2018 – AiPT! “I personally think it’s highly unlikely we’re alone in the universe,” said renowned actor Aidan Gillen at the “History’s Project Blue Book” panel at New York Comic Con 2018, on October 6. Gillen is best known for playing Petyr “Littlefinger” Baelish in the Game of Thrones TV series, but beginning January 8, 2019, he’ll be portraying astronomer J. Allen Hynek in History Channel’s new Project Blue Book series. It was a curious statement, considering whether alien life exists at all and whether it’s visited us down here on Earth are very different questions. Blue Book is a historical drama loosely based on the U.S. Air Force research program of the same name that investigated UFO reports between 1952 and 1969. Blue Book executive producer Sean Jablonski similarly muddied the waters, stating the “Are we alone?” question is “one of the great mysteries of our times.” The project is special for co-executive producer David O’Leary because he saw a UFO in New York City when he was 12-years-old, and even took a trip to the Inca citadel of Machu Picchu because he thought ancient aliens might have visited there. The series will examine a separate, real-life case report from the actual Project Blue Book every week, but more than that, said O’Leary, “it’s a show about uncovering identity.” Vampire Diaries alumnus Michael Malarkey plays an analog of Air Force officer Edward J. Ruppelt, a more straight-laced figure who often butted heads with Hynek. “That’s what Wikipedia said,” Malarkey reported. Ruppelt’s name may have been changed (to Michael Quinn) for a very particular reason. “I couldn’t pronounce the name at the table read,” Malarkey said. “He’s interested in the truth, I’m interested in closing cases,” Malarkey said of Hynek’s relationship with Quinn, although the real-life Ruppelt was said to be very even-handed, and even fired several Blue Book personnel who he thought were too skeptical coming in. “We both develop respect for each other,” Gillen said, but Hynek’s relationship with his wife, Miriam, tended to suffer. “There’s something missing in her domestic life,” said Laura Mennell, who portrays Miriam, who will have her own character arcs as the series progresses. The producers of Project Blue Book were the most excited of the panelists, with Jablonski citing the “high strangeness” of the UFO phenomena depicted, naming crop circles specifically, despite that particular trend not coming into vogue until the 1980s, long after the real Blue Book had concluded. O’Leary called Project Blue Book “the original fake news of its time,” citing a massive cover-up (which does have a kernel of truth — unexplained cases were not discussed with the public, though nearly everything is declassified now and can be obtained through the Freedom of Information Act), and nudging the crowd that Ruppelt died of a heart attack the young age of 37. Unusual, sure, but not unheard of. Mennell mentioned that despite the artistic license needed to turn actual events into a television drama, Project Blue Book strives for realism so much that Hynek’s adult children were consulted about his life. Panel moderator Damian Holbrook summed it up, praising the network known for producing programs such as Atlantis Found and Ancient Aliens. “When it’s a History Channel production, you know they’re going to make it as accurate as possible,” he said.